Are you familiar with Hometalk? It's a website dedicated to all things home improvement, indoors and out. Need any kind of inspiration or how-to for refinishing, building, creating, decorating or gardening? Check Hometalk first. Find the ideas you love and clip them to save them to your boards. One of my favorite aspects of Hometalk is the interaction. You don't just look, you can also ask and interact with the folks who are sharing their projects! 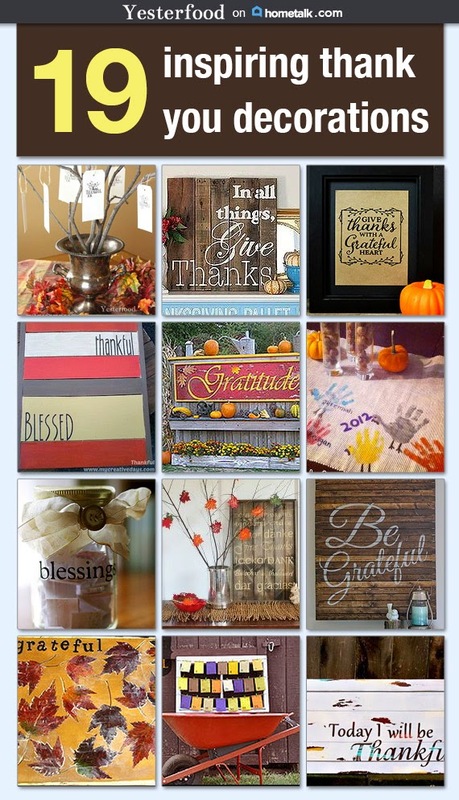 I recently clipped some Hometalk ideas for Thanksgiving decoration ideas. You can see them here, or just click the photo, above. The "grateful" part of Thanksgiving is important to me, so that's what I focused on. I hope you enjoy some of the things I found, and I hope you'll explore and find some things that you love, too. Lovely curated board, Joy :-) Pinned ! I love the theme of "Thankfulness". and Gratefulness. Thanks so much for sharing these ideas! I love Hometalk, and I love these ideas! Pinning and heading over to find you on Hometalk. I had never heard of Hometalk! Thanks Joy!